This year is the first year that we are celebrating Christmas with children. Several years in the past, we thought we would be, but unfortunately it didn't happen. The Christmas season has been so exciting, busy, and full of blessings for this mommy's heart. Our little girl saw this book when I first received it a month ago, but had been waiting eagerly for me to read it to her. Now she wants me to read it to her over and over. The illustrations are bright and beautiful with just a touch of whimsy. 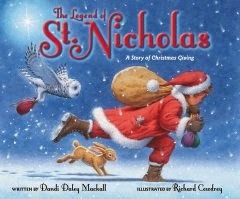 The story tells the story of St. Nicholas, the man behind the legend of Santa Claus. Instead of a jolly old man who gives children whatever they want as long as they were good, St. Nicholas spent his life giving to those around him who had needs so that they could see the love of Christ. What a beautiful story of what Christmas should be about for a Christian! If you'd like to read this book for yourself, you can find it on Amazon, at CBD, or wherever Christian books are sold. ****** I received this book in exchange for an honest review from BookLook bloggers. All thoughts and opinions are my own and I was not compensated in any other way. This sounds like such a lovely book! I'm going to go look for it in the library.